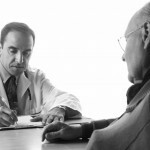 Up to a quarter of prostate cancer patients suffer temporary or permanent incontinence after surgery. Steve Gregory, 60, a retired IT director from Hampshire, underwent a procedure said to reduce this risk. ANGELA EPSTEIN reports. 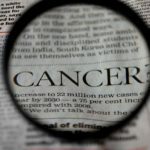 As someone who has always been fit, I never thought that I’d develop prostate cancer. 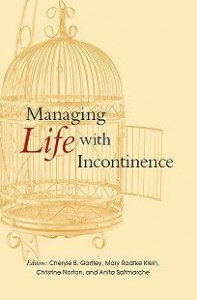 But for about a year before my diagnosis, I was waking up twice a night to go to the loo. In February 2016 I finally saw my GP, mainly because my close friend, Nick, had been diagnosed with the disease, so it was on my mind. Read more. Prostate cancer patients have seen their tumours destroyed with a revolutionary new laser treatment which has no side effects. Doctors in the US hailed the development as “exciting” because it could offer hope to millions of men diagnosed with the disease . Currently, prostate cancer is normally treated with surgery or radiotherapy which can result in erectile dysfunction and urinary incontinence. Read more. 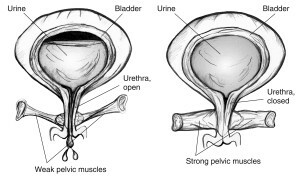 Weak pelvic muscles can allow urine to leak out causing stress urinary incontinence. 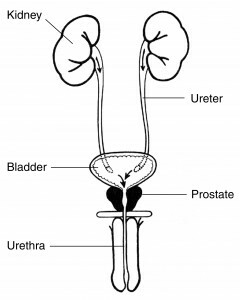 A man’s prostate can cause incontinence symptoms.